Leukemia is a cancer of the white blood cells that arises from the bone marrow and circulates in the peripheral blood. It is characterized by uncontrolled growth of white blood cells. Leukemia is a disease of the blood cells and does not usually form a solid mass or tumor. Although leukemia starts in the bone marrow, it can spread to the blood, lymph nodes, spleen, liver, central nervous system (CNS) and other organs. The terms "myelogenous" and "lymphocytic" denote the different types of cell involved. The terms "acute" or "chronic" refer to the rate of progression of the disease. Acute leukemia is a rapidly progressing disease that results in the accumulation of immature, non-functional cells in the marrow and blood. As a result, the bone marrow often can no longer produce enough normal red blood cells, white blood cells, and platelets. Chronic leukemia progresses more slowly and permits greater numbers of more mature functional cells to be made. According to the American Cancer Society, approximately 15,490 new cases of chronic lymphocytic leukemia (CLL) were diagnosed in 2009 in the United States. Chronic lymphocytic leukemia affects males more than females with men accounting for about 60% of all CLL cases. The incidence of CLL is much higher in Western countries than in Asian countries such as China and Japan. Chronic lymphocytic leukemia represents approximately 25% of all leukemias and occurs most frequently in the elderly population. The median age at the time of diagnosis is 70. Chronic lymphocytic leukemia usually does not develop in people under age 40 and is also extremely rare in children The incidence of CLL in the United States is higher in Caucasians than in African Americans. Recent research indicates that the 5-year survival rate of patients with CLL is 73%. The American Cancer Society estimates that about 4,500 people in the U.S. will die of CLL in 2007. If you or a loved one has been diagnosed with CLL, it's critical to learn everything you possibly can about this condition so that you can make informed decisions about your treatment. That's why we created the Medifocus Guidebook on Chronic Lymphocytic Leukemia, a comprehensive 201 page patient Guidebook that contains vital information about CLL that you won't find anywhere in a single source. The theories concerning the underlying causes of CLL. The specific types of genetic mutations that are found in people with CLL. The risk factors that can increase a person's chances for developing CLL. How CLL is diagnosed based on factors such as signs/symptoms, physical examination, blood tests, and specific genetic abnormalities. Which patients with CLL do not require any treatment for several years and may benefit from a "watchful waiting" approach where the disease progression is monitored carefully but no specific CLL treatment is given. The National Cancer Institutes guidelines for determining when initial treatment of CLL is indicated and should be started. The two most commonly used classes of chemotherapeutic agents that are used for the treatment of CLL, known as alkylating agents and purine nucleoside analogs. A new alkylating agent called bendamustine (Treanda) that was recently approved for the treatment of CLL. The side-effects associated with CLL chemotherapy and how to minimize their impact on your quality of life. A novel approach known as monoclonal antibody immunotherapy that has recently come into clinical practice which gives doctors the ability to preferentially target and destroy CLL cells. The role of stem cell transplantation in the management of patients with CLL, including the risks and benefits of this procedure. The complications, such as infection, anemia, and secondary cancers that may occur in people with CLL, including the management of these serious complications. The treatment options for patients with CLL who experience recurrent disease, meaning that the leukemia has come back after the patient had been in remission for a period of time. The role of complementary and alternative therapies in the management of patients with CLL. The prognosis (outlook) for people with CLL and the important factors that have a significant impact in predicting the overall chances of recovery and survival. Quality of life issues such as sleep disorders, fatigue, weight loss, and psychological stress that can negatively affect people with CLL and how to minimize the impact and cope better with these issues. Important questions to ask your doctor about CLL. A Guide to Recent Medical Literature on Chronic Lymphocytic Leukemia - This section of the Guidebook contains an extensive bibliography of over 100 references to recently published articles about Chronic Lymphocytic Leukemia in authoritative, peer-reviewed medical journals with links to the absracts (summaries) of the articles. These articles represent the latest advances in the field and focus on cutting-edge research, new developments, and the lessons learned from recently published clinical trials involving patients with Chronic Lymphocytic Leukemia. This is the same level of that is used by doctors who treat people with Chronic Lymphocytic Leukemia to keep abreast of the latest developments and breakthroughs in this specialized field of medicine. Centers of Research for Chronic Lymphocytic Leukemia - We've compiled a unique directory of doctors, hospitals, medical centers, and research institutions with special interest and, in many cases, clinical expertise in managing people with Chronic Lymphocytic Leukemia. The "Centers of Research" directory is a valuable resource for quickly identifying and locating leading medical authorities and medical institutions both within the United States and other countries who are considered to be at the forefront in clinical research and treatment of Chronic Lymphocytic Leukemia. You'd have to spend days - or even weeks - attempting to compile your own list of doctors and medical centers but, with the "Centers of Research" directory, the information is already right at your fingertips. All you have to do is act on the information by selecting and contacting the experts or medical institutions listed in the directory by state and country. Organizations and Support Groups for Chronic Lymphocytic Leukemia - The Guidebook also includes a directory of organizations and support groups whose goal is to help people with Chronic Lymphocytic Leukemia by providing access to information, resources, and services. Many of these organizations can answer your specific questions, enable you to "network" with other patients, and provide guidance in areas such as financial, social, or medical-legal issues. This valuable directory of organizations and support groups includes complete contact information, including phone numbers and E-mail addresses. 20% Discount - For a limited time, you can purchase the Medifocus Guidebook on Chronic Lymphocytic Leukemia at a special 20% discount off the regular list price. Your 20% discount will automatically be applied when you go to "Checkout". 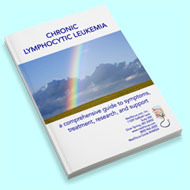 Order Your Copy of the Medifocus Guidebook on Chronic Lymphocytic Leukemia Today! The Medifocus Guidebook on Chronic Lymphocytic Leukemia is available in the following two convenient formats: Printed and Digital. "I was recently diagnosed with CLL and searched all over the Web for information. I found the MediFocus Guidebook on Chronic Lymphocytic Leukemia to be a very useful resource. The information about chemotherapy was most important to me as well as recent studies concerning general treatments for this condition. The most valuable information was contained in the extensive references listed which were easy to access with a simple 'mouse' click. You are welcome to use my name as a reference."